Build your cat a custom tree house. A cat tree house can be a fun and relaxing place for your cat to hang out and rest. Cat tree houses can be especially helpful for cats that live with children or other pets, providing a safe area for retreat. Bases should be made out of plywood or particle board for strength. Poles can be made from untreated lumber. For designs that use more than one pole for support, a 2-by-4-inch board is fine. For designs that use only one pole, use a 4-by-4-inch pole. Enclosures can be made from wood or MDF board. 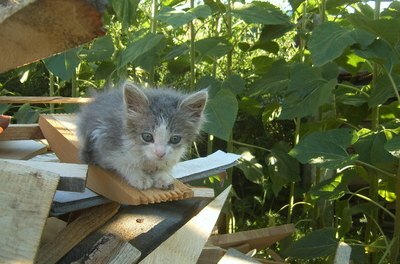 Cat tubes and perches can be made from cardboard concrete forming tubes. Cut the tubes in half to create two perches. Tree house posts can be wrapped in sisal rope, which will hold up better than carpeting to repeated scratching. Other areas of the tree house can be covered in carpeting or thick, soft material. Use a drill and screws to secure the poles to the base and the perches and tree house to the poles. Always use two or more screws so the poles and perches cannot spin lose. Use an ample amount of hot glue to secure the fabric and sisal rope. Carpeting can be secured to the base and tree house with a combination of wood staples and hot glue. 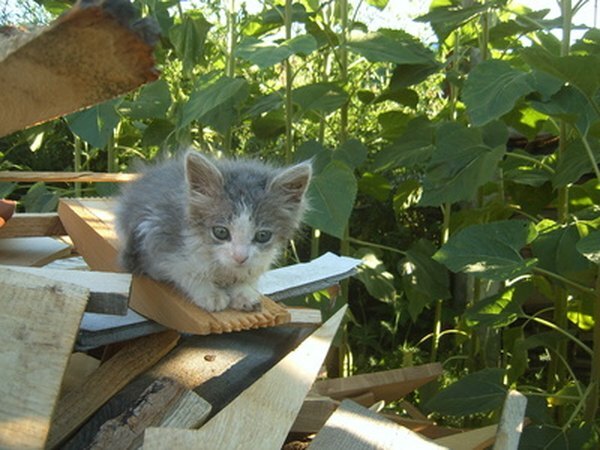 Once you understand the materials and tools involved, it is easy to copy the design of an existing cat tree house from a picture. You can also take bits and pieces of design from different cat tree houses that you like to make a completely custom design. Determine what kind of space you have to dedicate to a cat tree house and let that dictate your tree house dimensions. If you are no good at design, there are also websites that sell cat tree design plans. Are Willow Trees Toxic to Cats & Dogs? Why Do House Cats Pant? Does Cat Pee Kill Trees?